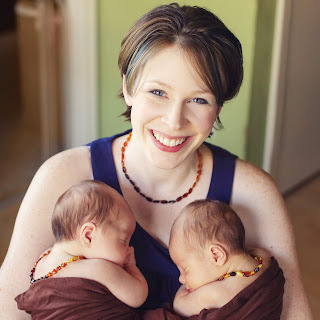 I just love getting second birth stories from women who have sent one previously. It just makes me feel special. And I can't say I have ever shared a birth story quite like this one! This mom had a home birth with her second child, but because of twins with the third pregnancy who had twin to twin transfusion, opted for a caesarean section at 34 weeks with her last two babies. I am simply so grateful that she was able to have two healthy babies despite the potential problems. Modern medical care is truly a miracle. I love too that this mom (as you will see) was treated with respect and even though she says this wasn't her "dream water birth" it was a good and healthy birth. This is just the birth story of my twins. It can be read alone or you can use the links below for the full story in 6 parts. Jesse and Max's story really begins at the start of my motherhood journey. I became a mother with the birth of my only daughter Lily in 2008. It was during this birth my eyes were opened to the abuses within the medical community. Her birth sparked a passion in me that is still burning 5 years later. My son Ehren was born with a midwife at home. When Ehren was around 17 months old my husband and I decided that two children would be enough for us and that possibly have two more 5+ years down the road if our finances supported it. Then I found out I was pregnant again. I was so busy and tired that I lost weight and my belly grew like it was in fast forward! My midwife asked me to consider an ultrasound. After finding out we were having identical twins at 18 weeks we were relieved that it wasn't anything more serious. I knew that with identical twins there was a risk of twin to twin transfusion syndrome. I thought that it was a black and white issue and that if you didn't have it your twins would have similar risks to singletons. I figured we would be fine and be able to have a vaginal birth at home and if I had to, I would travel to Dallas to find a midwife who would attend me there. We began seeing a Maternal Fetal Medicine group shortly after the diagnosis for ultrasound every 2 weeks. One baby was always measuring large and the other measured smaller. I usually had high fluid levels as well. But up until 24 weeks everything appeared to progress okay. We were constantly measuring the blood flow to the smaller twin and noting some abnormality in the umbilical blood flow. During the rest phases between heartbeats he would have no pressure and even a bit of back flow. In a singleton baby this would be a cause for great concern but with identical twins it is common. This is when I began to realize that this pregnancy was not a variation of normal. There were serious issues going on here. Around 24 weeks we were diagnosed with stage 1 TTTS and sent to Houston to see Dr. Kenneth Moise who had handled over 400 TTTS cases. After consulting with him he believed it wasn't classical TTTS but there was definitely a risk at any time it could turn into that and progress to dangerous levels within a matter of days. For now, the smaller twin had adequate fluid and was measuring average size. 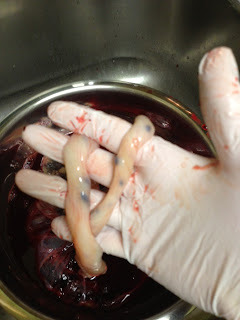 He wanted to keep a close eye on me and told us that we should prepare for a cesarean early or even laser ablation surgery to sever the connecting vessels in the placenta. We went in for weekly appointments with Dr. Moise until 27 weeks when it was decided that we were past the window for surgery and that we would squeak by if the boys continued to hold steady with their growth. We stayed in town for all future appointments. At each scan the boys continued to look good. Sometimes it would seem that we needed to worry about Max's heart enlargement and other weeks we would worry about Jesse's back flow through his umbilical artery. We would also be concerned that my high fluid levels would lead to preterm labor, but nothing got bad enough to merit intervention. At 30 weeks, Jesse started to show signs of growth restriction. 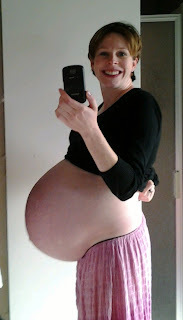 He started falling in percentiles and by 33 weeks his abdominal circumference was equal to that of a 16 week baby. We knew that delivery at 34 weeks would give Jesse the best possible shot because at that age with growth restriction, babies do better out than in. It was determined that it would be via cesarean as the risk of acute TTTS (sudden blood flow to recipient twin due to stress of labor) was low, but would be potentially catastrophic to Max. I was nervous to be back in a hospital again and nervous for the babies. 34 weeks. My last belly shot. January 8th at 5:30am we were to report to the hospital to have vaginal bypass surgery. We woke up bright and early and grabbed McDonalds on the way. Lucky me got to smell it but was not allowed to eat! Brandon sure enjoyed his large coffee. True to tradition he wore his Superman tee for the birth of our final babies. After checking in we went to preop to change clothes and get an IV. It felt cold going in and then we waited for a while the room was prepped for surgery. My doctor came by to chat with me and reassure me and find out if I had any questions. I gave her copies of my birth plan for all the nurses. 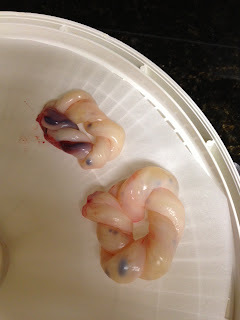 Several were curious about what I was going to do with my placenta. They were surprisingly respectful when I told them I was going to encapsulate it. Finally the room was ready and I walked in there and sat on the edge of the bed. My doctor introduced me to her husband who was assisting and the rest of the team. The anesthesiologist must have been in training because an older guy was watching and telling her what to do. She told me to curl into myself and I would feel a sting like an ant bite. Not exactly much room to curl when you have a belly full of twins. My doctor stood in front of me and held me and coached me through it. Yes I felt the "ant bite" sting and then the spinal needle! Not numb at all guys! It felt exactly like what it was... A big giant needle in my spine. I must have tensed up quite a bit and the anesthesiologist said she had to do it again because I was too tense. Yeah... It's my fault you aren't good at the whole numbing step. She proceeded to "numb" me again and once again it didn't numb at all before she was jamming the needle in my back again. I kept telling them I felt it and they must not have believed me and asked me which side. I told them the right side and they acknowledged that I was correct and must be feeling it. Thankfully she got it this time around and I quickly became numb. From there they quickly laid me down and Brandon came back in. They put comfy warm blankets over my chest and a little cap over my hair. The drapes were not on the side where Brandon was so he got to see everything! Everyone seemed to be in a good mood and the husband/wife doctor team talked through what was going on as I had requested. Not long after little Jesse was lifted out and he screamed and cried loudly. I got to see him and then he was taken away to be checked out by the pediatrician. 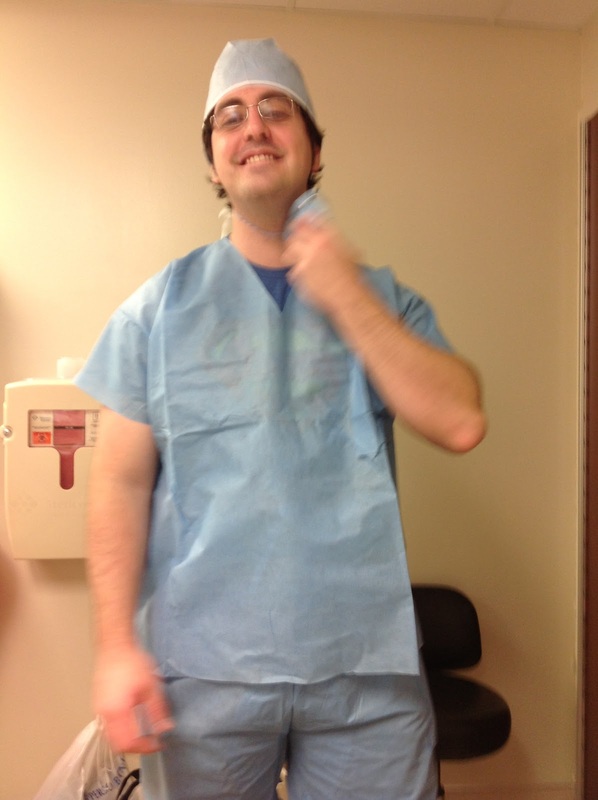 Then Max was lifted out one minute later and proceeded to pee all over Dr. David Damian. Everyone laughed because when both babies were screaming and crying they sounded like cats fighting! They all assured us that was a good thing. The pediatricians checked them out and they were blanketed and hatted and given to Brandon to hold. He showed me them one at a time and posed for pictures. I forgave the anesthesiologist for poking me twice because she took all the awesome pictures of the birth. As soon as the cutting started I started feeling like I was being stabbed in the shoulder. I told the anesthesiologist and she said it was called referred pain and could only give me morphine which she did giving me the maximum dose. It turned into a dull ache but I still felt it for hours afterwards. I had no idea that could happen. It was very strange. Brandon then went with the boys to the NICU and I was sewed back up. They were impressed with the size of my uterus and said my insides looked beautiful which I found charming and a little gross. Once I was all sewed back up Brandon came back. One nurse made sure my placenta got bagged and given to Brandon to put in the cooler to take home. I only got to see a glimpse of it but was told that it was large and looked good. We then were wheeled into recovery. We asked about the boys and were told they were well and given their stats. Max was 6 lb 5 oz, 19.25 in long and Jesse was 4 lb 15 oz, 18.5 in long. 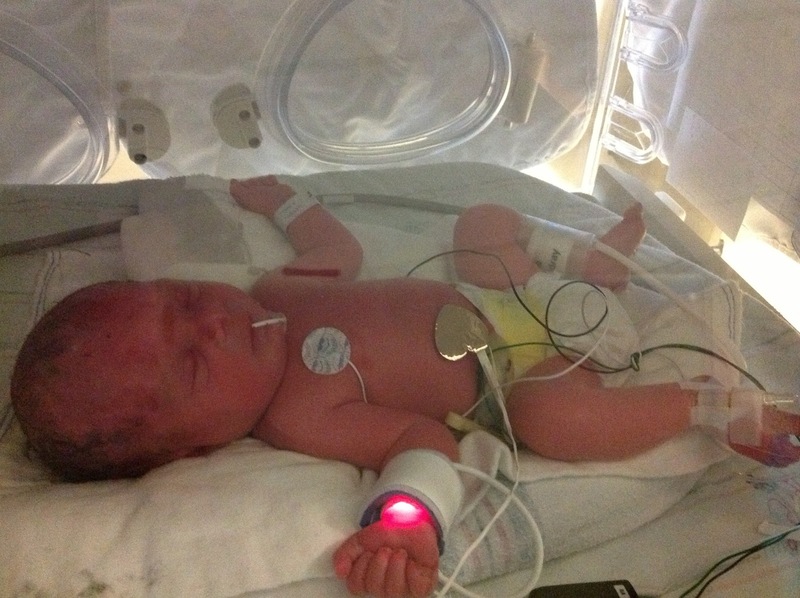 Jesse in the NICU. Note how tiny his body is in comparison to his head. 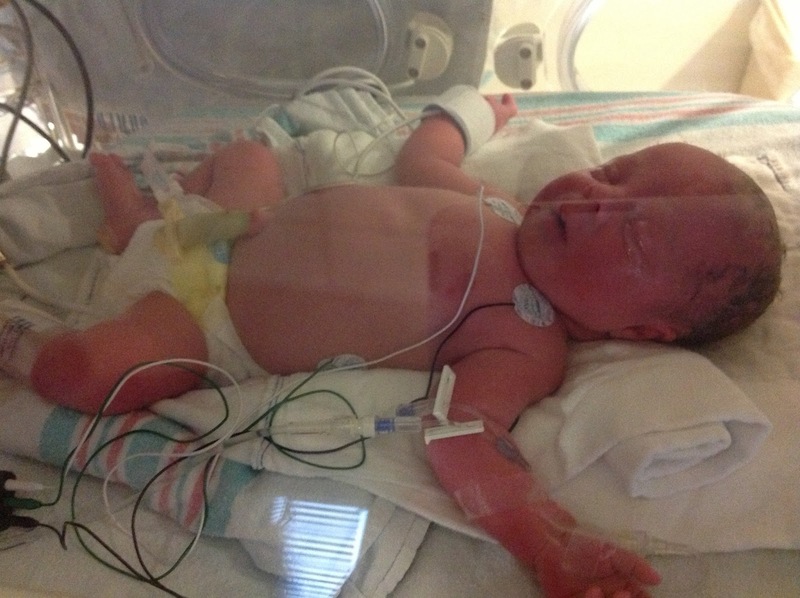 Max in the NICU. See how much bigger his body is compared to Jesse? Brandon went with the boys while I was stitched up and watched as the boys were set up in the NICU. They were breathing fine but were given tubes in their mouths to help evaporate the fluid from their lungs, temperature monitors, heart rate monitors, blood pressure cuffs, and oxygen saturation monitors. He briefly visited with some family and friends that had come, grabbed a coffee and came back to me. After we spent some time in recovery I was wheeled to the NICU to see the boys on my way back to the room. I couldn't see them very well and don't remember very much about it. We were then taken to the largest and fanciest room (perks of twin births). I was instructed to relax and get some rest. That's pretty much what happened! It wasn't my dream home waterbirth but I was treated with dignity and respect. My boys were given the care they needed and they did well. Could we have had a vaginal birth? In all likelyhood yes. Could I have had the support to accomplish this and was I comfortable with the risks? No. I think I made the right decisions for me and the babies given our resources and I'm satisfied with how it all turned out. Max was getting a whole lot more nutrients! Umbilical cords. Note the difference in thickness! 2 weeks old. See the difference IUGR can make! 4 Months old - Jesse is catching up! happy tears that this family has been blessed with two beautiful, healthy baby boys.... thanks for sharing this story! What a wonderful story. It brought back many memories as my own identical twins (girls; 13m now) had similar growth differences and had to be closely monitored. I was fortunate that mine were able to go to 'term' at 37w and I had a vaginal birth. 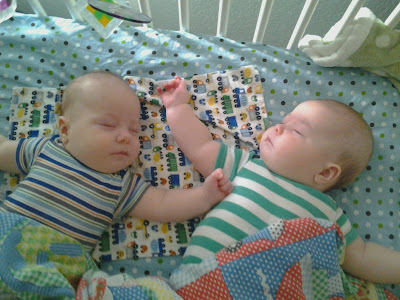 Funnily enough, my twins weighed almost the exact same as these boys at birth - hers were headed to being big babies. There is still a significant difference in sizes between my girls, but that helps us to identify them. I remember my first thought upon hearing 'twins' at an early ultrasound (10w because midwife was suspicious of my sudden growth and I had other internal issues going on) was "crap, there goes a second home birth". I really, really did not want a hospital birth (my first/only was at home), but I eventually came to terms with that over the next several months. Everything went very smoothly and in hindsight, a home birth would have been perfectly fine - if any midwives around here would do it - but of course, you never know with multiples. Baby B could have just as easily spun around as descended head first. Wee baby A could have had more problems as a result of the transfusion. Throughout my entire pregnancy Jesse (a) was jammed against my cervix... He wasn't exactly stuck but he didn't move either. By 20 weeks he was vertex and never moved. At 32 weeks Max(b) settled vertex and pressed against Jesses head so hard he had a hematoma and Jesse's skull plates overlapped three times at the top of his head. At my cesarean, my doc commented that Jesse had a hand and cord presenting. Perhaps in labor they would have moved more favorably. I'm really happy for you Mandyz that you got your vaginal birth and it went smoothly! I think that takes a special courage to face a hospital after the awesome experience of having your first baby at home.